Metalworking Machinery Manuals, Prints, and Drawings for over 5,000 Builders. You can enter and use our secure website without fear that your information will be shared or used for advertising or spam purposes. We gather only the information required by the credit card companies. We will never store or share your information with anyone but the credit card, PayPal, and/or Google Checkout companies. You are NEVER required to register here. Use the SPECIAL OFFER button on the HOME page if you specifically prefer to receive very occasional promotional information from us. Please allow our experienced Research Technicians to perform a free manual research project for your machines today. so we can provide the correct documentation for your machine. NOW SAVE 50% ON 2ND COPY MANUALS! THAT'S RIGHT, CHANGE THE AMOUNT IN YOUR CART TO (2), ENTER THE COUPON CODE "2nd Copy" IN THE COUPON BOX YOU WILL RECEIVE BOTH THE "ELECTRONIC DELIVERY" AND THE PROFESSIONALLY BOUND MANUAL(S), WITH 50% OFF ON THE 2ND MANUAL. Cincinnati Tray-Top Lathe Operating Instructions Manual. Titled: General Installation and Operating Instructions-The "Tray-Top" CINTILATHE. includes Sections for Description, Operation, Inspection and Lubrication, and Maintenance. It also Includes Electrical Diagrams. THIS IS PROFESSIONALLY BOUND HARD COPY ONLY. Cincinnati Tray-Top Lathe 10, 12 1/2, 15 and 18" Model LE Service Manual and Parts List. Includes Preparation for Use, Operation, Maintenance, Functional Diagrams, Lubrication, Exploded View Parts Section and generic Electrical Diagrams. 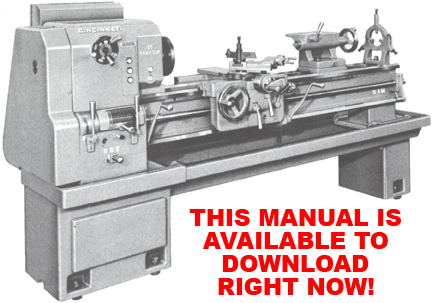 If your Lathe looks like the photo, just click ADD TO CART and select ELECTRONIC DELIVERY to download this manual now. CINCINNATI 21.5" and 26" Tray-Top Lathe Operations, Maintenance & Parts Manual. Includes Installation, Operation, Maintenance, Lubrication, Exploded View Parts Section and generic Electrical Diagrams. 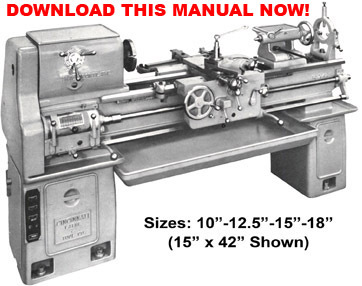 If your Lathe looks like the photo, just click ADD TO CART and select ELECTRONIC DELIVERY to download this manual now. CINCINNATI 16", 18", 20", 24" Lathe Installation, Operation, Parts Manual. Includes electrical diagrams. THIS MANUAL IS AVAILABLE FOR INSTANT DOWNLOAD. If your machine looks like this photo, just click ADD TO CART and select ELECTRONIC DELIVERY! Cincinnati Hydrashift Lathe 10"-12.5"-15"-18"-21.5"-26" Model LRT Preparation for use, Operation, Maintenance and Parts List Manual. This manual applies to Hydrashift Lathes built from 1960 through 1964. If your machine looks like the machines in the photo and the last 2 digits of the serial number (before the dash and the numeric designation) end in 5J, 5K, 5L, 5M, 5P, or 5R, this is the correct manual for your machine. 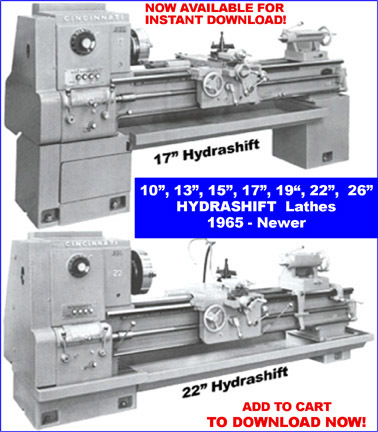 Cincinnati Hydrashift Lathe 10"-13"-15"-17"-19"-22"-26" Model LR Preparation for use, Operation, Maintenance and Parts List Manual. This manual applies to Hydrashift Lathes built from 1965 and newer. If your machine looks like the machines in the photo and the last 2 digits of the serial number (before the dash and the numeric designation) end in 6R, 5S, 5T, 5U, 5V, or 5W, 5Y, and 5Z, this is the correct manual for your machine. Cincinnati Lever Shift Hydrashift Lathes Model LRT Service Manual and Parts List. If your machine looks like the photo, this is the correct manual for your machine. Available for instant download.